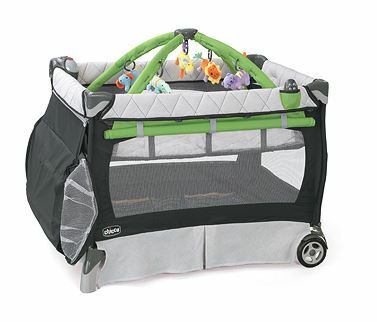 Any parent would undoubtedly want to get a place for their baby such as this 4-in-1 Chicco Lullaby LX Playard. They can be sure of their baby’s comfort and safety when they are placed in this playard. Other than being a place to put your baby, it comes with three different pieces of baby equipment that you and your child will surely love. Whether it is time for your baby’s nap or play, this is the perfect place to put her/him. It is a portable baby system that every parent will desire to have. If you are in a constant loss as to where you would put your child when you are to change him or when he’s playing, then worry no more. This will be of great use to you. The system has a compact playpen with a padded mattress for your baby’s comfortable play. It can also be removed when you need to wash it. There also is a changing pad for your infant. If you ever have an accident while changing, the vinyl cover will not be too difficult to wipe off. No sweat, right? The changing table is sturdy because it is attached to the baby pen using four buckles and a zipper. The bassinet will be a very comfortable place to keep your baby safe when it’s nap time. The quilted cover will take your child to dreamland in no time. Upon waking up, they will not be squealing because they will be fascinated by the toy gym that is included. It has adorable plush animal toys that kids would love to look at. The baby play pen is not named “Lullaby” for no apparent reason. The system has music, vibrations, and a nightlight. Even from a distance, you can adjust the settings with the use of a remote control. Aside from that, there are storage pockets for your changing supplies. When you plan to bring it along, you can just fold it quickly with the push-button mechanism, and you are good to go. It has a matching carrying bag so you can put it in the trunk without any hassle. This is the system you definitely should get for your little angel. Chico LX Lullaby playard is a cot on wheels, that too with an entertainment system that any child would enjoy. A playpen such as this is what puts a smile on every child’s face, as they can now stay in the vast and spacious area of the stroller. The changing table upon which the structure stands on is strong and firm. Initial set-up is easy to do, and there is no hassle involved with long-term use. Even though it looks frail, the body of the device is capable of sustaining mild damages, which makes it an ideal stroller for long journeys and destination trips. This is a very new item, which is why it did not get many responses from the customers. However, those who did use the playard, have reported that their children have enjoyed the music and games of this playpen. The mattress can be washed by machines, and the overall hygiene is squeaky clean. The bassinet has been said to be somewhat shaky, and that causes problems for users who use the stroller all day and all night. It is also very durable, and a few customers have stated this stroller to be pushed to near perfection.